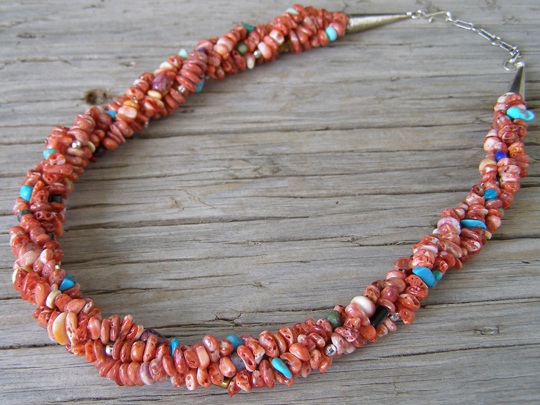 This four strand choker necklace is strung with small "nuggets" of red spiny oyster with highlighting accent beads of purple and orange spiny oyster, lapis lazuli as well as blue and green Kingman turquoise and some small faceted, sparkly beads of glass. Susie has strung this in a fashion that gives a single roped, thick strand comprised of the smaller strands. This single, large strand is about 5/8" in diameter.